Well, I bought this 2007 xc70 with 213,000 miles. I did not pay much for it and it runs great and is in good shape. Tires, brakes,battery,all new. 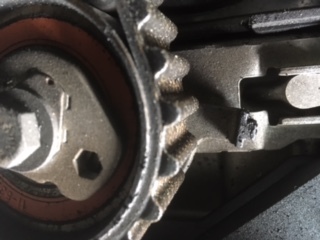 Prior owner was not sure of last timing belt replacement and no sticker. I ordered timing belt and water pump kit. 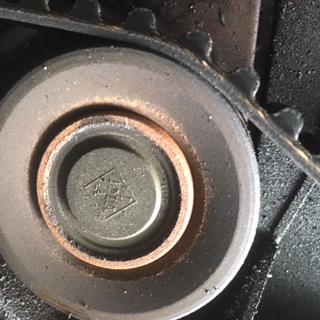 But, when I pulled the timing belt cover i have second thoughts. 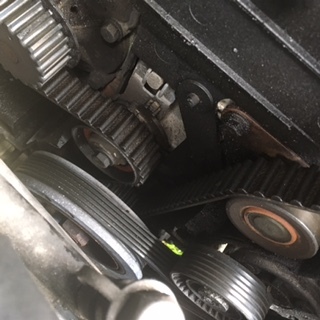 First the serpentine belt looks great ,no cracks at all. 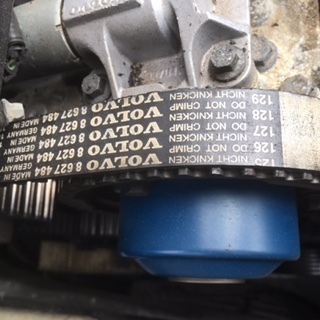 The timing belt has no cracks, and the white printing is barely worn at all. Tensioners look good with no signs of grease being thrown out. So, at this point I'm thinking being a used car with lots of miles, I may just wait a while on that timing belt job and see how everything goes over the next few months. See if anything else rears it's ugly head and should i just dump it and accept my loss. If it's running good then maybe I'll do the timing belt, water pump in the fall. Thoughts??? your model should have a 10 year, 120,000 mile interval. It looks like Genuine Volvo parts were used so I'm wondering if the dealer could tell you from the car's records. Assuming it was done at 120K, you still have another year or two before the 240K mark. if the car was dealer serviced, a full Carfax report usually shows the major servicing details.